Silver Cross Field in downtown Joliet. I think I’ve already mentioned, I really like baseball. Most guys spend all year getting ready for their fantasy football draft….I look forward to April because baseball’s starting. I’ve been very lucky the last seven years having a Midwest League team in the city I’ve lived in. Trust me, I’ve taken advantage of that. For my first two years of college, I played baseball at the University of St. Francis in Joliet, IL. We played our home games on a pretty nice field at Joliet Catholic Academy (high school). Since I went to a small high school, this field was a huge step up, but for most of the guys I played with, it was a step down. 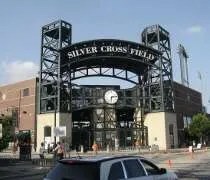 In 2003, USF got a huge opportunity to play it’s home games at the newly built Silver Cross Field in downtown Joliet. I never got to play there or even see it before I left school, but the park’s main tenant is the Joliet Jackhammers of the Northern League. The biggest chicken breasts you’ll ever see. That’s how I used to describe the chicken from my favorite chicken joint. 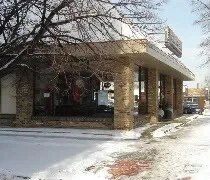 I went to school at the University of St. Francis in Joliet. I wasn’t quite the foodie then that I am now. When I ordered out, it was usually to Papa Johns or one of the other national chains. I wish I knew then what I know now about food in the Chicago area. I’m sure there are hundreds of places I missed out on. Fortunately, one of the places I didn’t miss out on was a little chicken joint in downtown Joliet. Chicken-N-Spice sits on Chicago Street near the ballpark, theater, and casino. 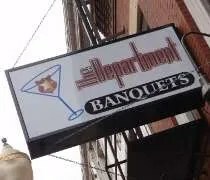 There’s not a lot of food options in downtown Joliet but as far as I’m concerned, there only needs to be one. I was on my way to my parents how from DeKalb when I got the idea to detour to Joliet. I was tired of paying tolls anyway and I was running out of cash. I now owe the Illinois Toll Authority some money since they still have the change baskets on I-88. Seriously, who carries $1.10 in change? I thought they were doing away with all of those and didn’t bring enough home with me. Instead of dealing with that, I got off I-88 and made my way to Route 30 which would eventually take me into Joliet. 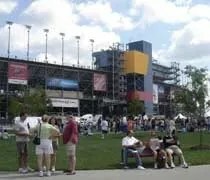 My final stop in Illinois this week was at Chicagoland Speedway in Joliet, IL for the IRL Peak Antifreeze Indy 300. I went to school in Joliet and this track was being built during my senior year. The first race was the summer after I graduated. Chicagoland doesn’t sell individual race tickets. The only way to get tickets to any of the races is to buy tickets to all the races. That first year, a buddy was able to get Busch series tickets off eBay, and until this weekend, that was the only race I had been to other than NASCAR qualifying. My dad’s cousin buys the track pass every year to get tickets to the Nationwide and Sprint Cup race, but they couldn’t care less about the ARCA/IRL weekend. For the last few years, I’ve wanted to get their IRL tickets, but I always had something going on. This year, it just worked out that I was going to be in town, so my dad asked for the tickets and he and I finally got to go to an IRL race.